Leaving a gift for the International Service for Human Rights in your will is an effective and enduring way to advance human rights for years to come. 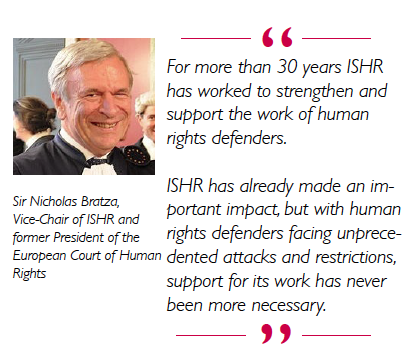 For over 30 years ISHR has supported and protected human rights defenders around the world, strengthened international and regional human rights systems and laws, and contributed to lasting human rights change. With your support and our intensive training and principled advocacy, we will make the world a fairer, more peaceful and sustainable place for all. The suggested wording for your will here is intended as a guide only. It’s important that you consult a professional, such as a lawyer or financial consultant, to make sure that your will clearly states your intentions and that it complies with the laws in your country. If you already have a will, you can add a “codicil” to your existing will or revoke the will and write a new valid will. If you choose to add a codicil to an existing will, you must ensure that what you add doesn’t contradict parts of the original will. Again – it’s important that you obtain independent legal advice on these matters. 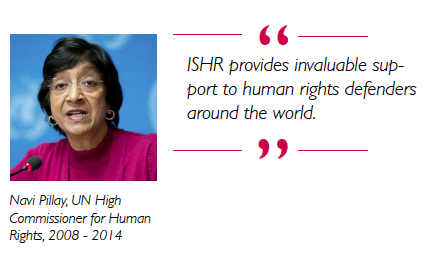 If you include the International Service for Human Rights in your will, please let us know. This will allow us to personally thank you, better plan our future programs and, with your consent and guidance, recognise your generous support.